I first heard about Hokki stools from a colleague who attended a seminar highlighting best practices involving brain-based research. I looked them up online. My first impression was that Hokki stools resemble large, odd, colorful plastic mushrooms. Over the past two years, I have discovered that is an almost universal initial response to the product. If you don’t mind an untraditional look to your classroom, I highly recommend giving this seating option a try. Students really appreciate being able to rock back and forth, with an occasional spin for flourish. 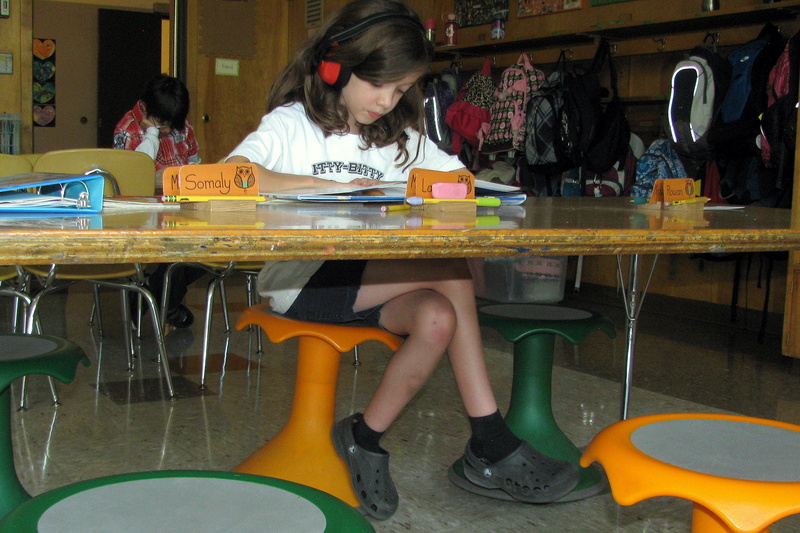 The stools seem to absorb excess energy since a student is able to be in a near constant state of movement and remain on task. That said, I advise being very specific with how the Hokki stools are to be used. Common sense should prevail. However, even once the ground rules have been established, you may find yourself saying, “Please remember, it is a tool, not a toy” several times during the work day. Below is a copy of a submission I made to DonorsChoose http://www.donorschoose.org/ an online charity based where individuals and corporations make donations to support teachers’ projects. If you would like to request a similar project, feel free to use this submission as a guideline. The work is not to be copied. The goal is to provide teachers with what I hope is a helpful model of a successfully funded request. Feel free to contact me with any questions; I am happy to help! If you would like to contribute to our current project of trying to obtain a 3D printer, please follow this link: http://t.co/nLtdpcqiuA Thank you! If you were in elementary school in the past six decades, you probably sat in the kind of chair that still clutters my classroom today. Heavy, hard, mustard-colored, stained with the markings of hundreds of past students. It is time to change all that. These cool ergonomic stools would do the trick. My students are a charming, deserving, active bunch of third graders in Oregon. They are dedicated to learning and processing all the information we share each day. My room is clean, open, and airy. We move a great deal. This is a necessity. We stretch, dance, and wiggle. During instruction, children are allowed to stand if that helps them concentrate. At any given time in my class, you can find a student engaged in the lesson, hopping in one place. Our school was constructed in the early 1950’s, we are surrounded by reminders of the era. I am all for the retro look, when it comes to art work and color scheme. My classroom chairs are like industrial tanks, with no level of comfort whatsoever. My principal just helped me drag a low table into my room in order to allow six students to sit on carpet squares while working. This has been an extremely popular option for everyone. The students are comfortable there, I have a more streamlined learning environment, and the custodian has six fewer metal chairs to deal with. I want to get rid of seven more chairs and replace them with these funky Hokki stools. My students need to move while they sit; you can witness it by the amount of unsafe chair tipping and rocking that goes on. With the Hokki stools, children will be able to move, even when sitting. I truly love teaching. I share my enthusiasm every day. It is so important that my classroom provides the best possible learning environment: Uncluttered, clean lines. I embrace my students’ different learning styles, and accommodate those needs as best as I know how. Being able to offer my third graders these Hokki stools would be added inspiration. They can sit and move in all directions, making for a happier child. Plus, seven vintage chairs will be available for that Mad Men retro look. My students need the opportunity to move, even when they are sitting down, using these 7 Hokki stools. I want to sincerely thank you for your generous contributions to Room 17. These seven Hokki stools have been an amazing addition to our school community. Each week, after our Friday class meeting, I pull names out of a cup. 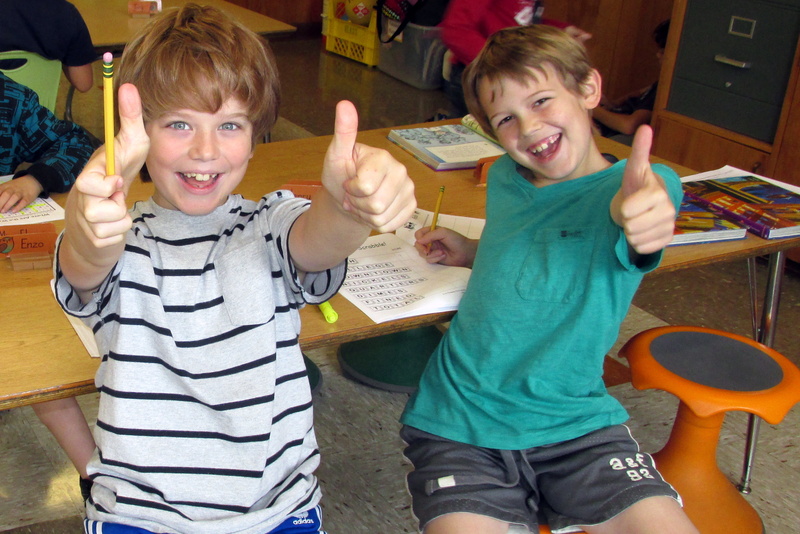 When a name is selected, students are dismissed to choose their seats for the upcoming week. As you can imagine, the Hokki stools are the most popular seating option. Through trial and error, children discover that there is a learning curve to proper Hokki stool seating. Overly rambunctious tipping has resulted from a few spills, and those who get dizzy easily have decided not to spin anymore. Now, having enjoyed the Hokki stools for several weeks, students have settled in and respect the parameters of the stools. As an added bonus, our principal often holds staff meetings in Room 17, and even the teachers appreciate an opportunity to move while sitting. So thank you again. You have made a marvelous difference in inspiring young learners. Hi there! I’m wondering how you go about teaching students how to use their Hokki stools. What protocols/procedures to you put in place? Hello Derek! In our third grade classroom, we talk about the materials around us as “tools, not toys.” This seems to cut down on the spinning, as well as clear expectations about feet on the floor. The stools don’t get picked up and moved around unless we are putting them on tabletops at the end of the day, or cleaning them each Friday. Students get two reminders before the third one has me moving them to a more suitable spot.